If you're going to choose to experimenting with one thing or another, you really can't go wrong with Pizza! We've enjoyed loads of pizza experiments and I think I'm getting better and coming up with ideas as well as critiquing each pizza. I didn't love this sauce, but also knew from the beginning that I wouldn't recreate in the exact same way, ever again. I would have liked to use only Cream Cheese for the 'sauce', but I had some plain yogurt that need to be moved out of the refrigerator, therefore, it went into the mix...and then I had to pile it on, not entirely ideal. Regardless of all the small things I would change given the opportunity, I truly enjoyed this pizza pie and will continue to work with this concept. Using the bread machine to prepare the dough for pizza crust is an easy way to ensure proper rising, etc. 1 1/2 cups Water, 1/4 cup Olive Oil, 3 1/2 cups Flour, 1 Tbsp. Sugar, 1 1/2 tsp. Salt and 2 tsp. Yeast. Spread crust with a whipped, softened Cream Cheese. 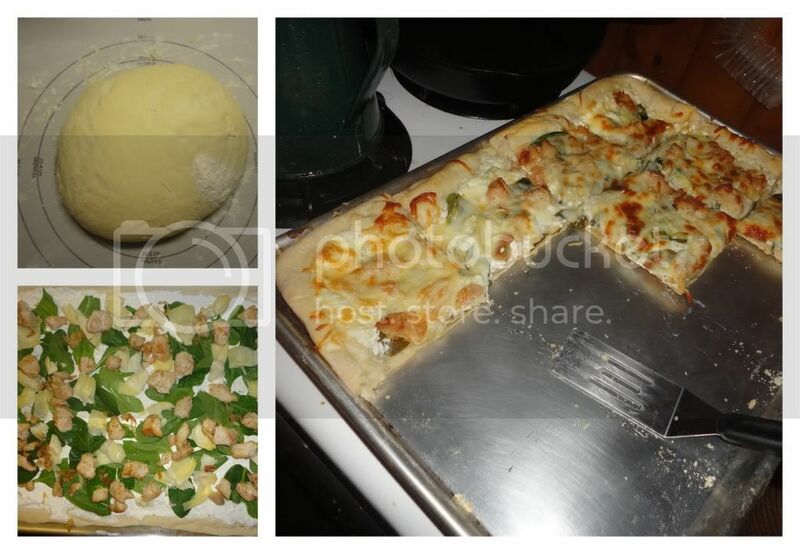 Top with Pan Cooked Chicken, Artichoke Hearts, Spinach, Mozzarella and Parmesan. Bake at 450 for 10-15 minutes until cheese is golden and bubbly. Enjoy as part of a budding Family Pizza Night tradition.